I couldn't convince the hubby that mincemeat pie would be a nice savory addition to our Pi Day plans (darn! ), so we decided to go with chicken pot pie. We made Chicken Pot Pie for last year's Pi Day Celebration as well. However, while that recipe was tasty, it was a little fussy and not quite *perfect*. So this year we decided to try another recipe. 1. 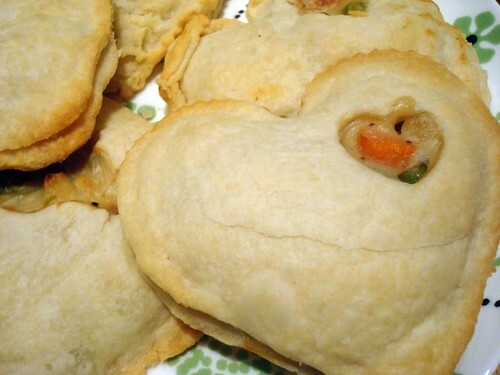 I vastly prefer small chicken pot pies. I like a high crust to filling ratio and large pies cut into slices just don't hold up well. However, you can totally make this in a larger 9" pie pan. Just lay down your bottom crust, add the chicken mixture, pour the liquid over the top, add your top crust, and bake. Voila! A full sized pot pie. 3. We made this with the Perfectly Flaky Pie Crust, omitting the sugar from the crust to make it just right for a savory filling.